If you haven't played golf in a while and recently decided to pull those old golf clubs out of the garage, you might be surprised to notice rust buildup. Because graphite and stainless steel don't rust, the clubs that are most vulnerable are made of mild carbon steel. 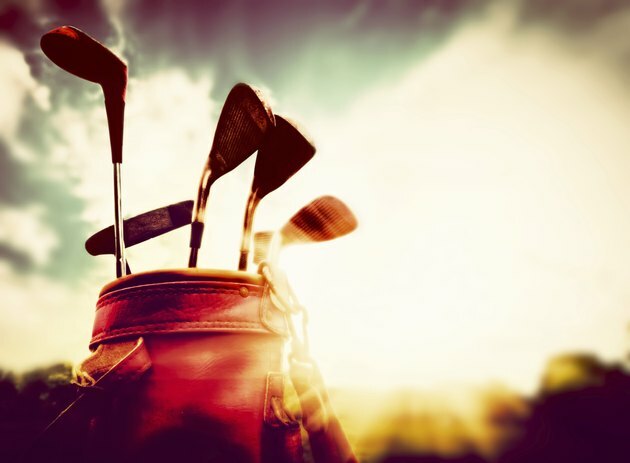 You don't have to give up on those old clubs though, because you can easily remove the rust and restore them to great condition fairly easily. Prepare your clubs for restoration by wiping them down with a damp cotton cloth. Sometimes mud can get stuck in the grooves in the club head. If this is the case, use an old tooth brush to remove the stuck dirt from the grooves. If the clubs are particularly dirty, soak them in a bucket of water with mild soap to help loosen the debris. Use a piece of steel wool to begin removing the rust from your golf clubs. You don't need to apply a lot of force. The wires of the steel wool will provide enough friction to scrub away the rust. Start at the club head and work your weight up the shaft. Make sure your clubs are dry before using the steel wool. Restore the original shine. Using a soft cloth, apply metal polish and begin polishing each club. Follow the directions specified by the metal polish manufacturer. Most metal polishes are typically applied by using one towel to wipe the polish on, then waiting 60 seconds for the polish to set. Once the polish sets, you can use a separate towel to wipe the club. Use a cloth to wipe your clubs down after each time you play to help prevent rust build-up. Store your clubs in a cool, dry room instead of a garage, since heat, moisture and humidity encourage rust buildup. Wipe your clubs dry before storing them if they get wet. Alternatively, you can use a rust remover. However, check to make sure it is safe to use on your clubs. Some rust removers can damage your clubs.